Katen Patel, portfolio manager of the JPMorgan Smaller Companies Investment Trust, JPMorgan Mid Cap Investment Trust and JPMorgan Elect Managed Income Investment Trust, explains some of the key considerations when looking at investment trusts. 1 They’ve been around for nearly 150 years. These publicly listed, closed-end vehicles are traded like any other share on the stock exchange and come with a plethora of underappreciated benefits. Managing three investment trusts, I have experienced first-hand the value of having an experienced board of independent non-executives that meet with the portfolio managers every few months to share views on markets, evolve the strategy for the fund and ensure the trust is run in the best and most efficient manner. 2 They permit the use of gearing. A key differentiator between investment trusts and their open-ended cousins is the ability to use gearing. Particularly in an environment where rates are expected to be lower for longer, having an attractively priced debt facility to strategically or tactically gear up when equity markets are rising can provide a helpful kicker to returns. Equally, investment trusts can also de-gear and hold cash in more difficult equity markets. The Mid Cap Investment Trust currently has a gearing range of 95% - 115%, for example. 3 They can trade at a discount or premium. An investment trust trades at discount or premium to the net asset value (NAV) of the underlying holdings in the fund. From time to time, discounts can move wider and provide an attractive buying opportunity – as the discount reduces, this provides a boost to returns over and above the NAV returns. In the last financial year for the Mid Cap Investment Trust (to 30 June 2018), shareholders have enjoyed a 16.4% NAV return, but due to the discount narrowing have experienced a share price total return of 27.4% – well in excess of the benchmark return of 11.2%. 4 They can hold a revenue reserve like a listed company. Investment trusts have the ability to hold a revenue reserve (up to 15% of their income each year), much like any listed company might do – this revenue reserve is typically used to ensure a stable level of income for shareholders over time, smoothing the dividend payment. For example, the Mid Cap Investment Trust currently has a revenue reserve of over 12 months, which could be used to maintain the current dividend payment should we go through a period where the investments we hold start paying less income to shareholders than in previous years. 5 They eliminate the issue of cash inflows and outflows. Being a closed-ended vehicle also provides a portfolio manager with the certainty of assets, as there are no cash inflows or outflows to deal with – this can be beneficial to performance and also enable larger position sizes and investments in more illiquid holdings. 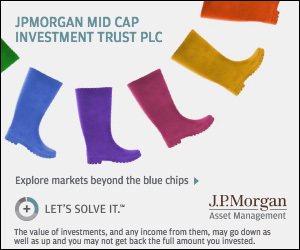 The JPMorgan Mid Cap Investment Trust currently has no sector constraints and a stock limit of 5% active on initial purchase, which has been fully utilised on a number of occasions to the benefit of returns. As at 30 June 2018, over the last five years the share price of the trust has delivered over 132% whilst its FTSE 250 ex IT benchmark has delivered only 72.6%, ranking the trust in the top quartile versus its peers.